Cecil B DeMille’s THE KING OF KINGS is a barking mad, surreally vulgar wondershow — the cavalier rewriting of gospel alone is hilarious and delightful, especially in a film so bent on being sincere and respectful and religious. The more DeMille falls over himself to be respectful, the more he smears his idol in kitsch und klatsch. He just can’t help himself. Since the Bible doesn’t paint in too many memorable, specific or convincing characters, at least as modern dramaturgy would see it, DeMille and his scenarist Jeanie Macpherson depict the disciples with broad strokes, like Disney dwarfs. Young Mark is a wee boy (cured of lameness, he slings away his crutch and biffs an adjacent pharisee), and Peter is portrayed as a giant and strongman, the Porthos of the Apostles. DeMille’s portrayal of the Magdelene (Jacqueline Logan) as a sultry, high-class courtesan is exactly what one would expect from him — she even has an exotic make-up kit and tray of perfumes, just like Gloria Swanson would if it were one of his modern comedies of manners. She has quite a menagerie too — zebras, swans, a tiger and a monkey. Every bible movie ought to have a character whose social status the audience can aspire to, and she’s it. If you need a trivia question, I propose, “What movie features both Ayn Rand and Sally Rand?” Hint: it’s this one. DeMille’s frequent collaborator Lenore Coffee (see here for smutty making-of anecdote on this movie) though HB Warner wrong for the role — Jesus was thirty at the start of the script, and Harry W was fifty. Also Jesus was a carpenter, a craftsman but also a physical labourer. “If Harry Warner picked up a hammer he’d drop it on his toe!” She suggested he-man actor William Boyd (star of DeMille’s THE VOLGA BOATMAN), but she later decided he was a good choice, because he fit the stereotype. There had been so few movie Christs that the public needed someone who obviously fit the bill — maybe later a more challenging portrayal would be possible. KING OF KINGS, the Nick Ray version, really is a good film, it just doesn’t have a very good Jesus. A shame, since everyone else in it, apart from a few dubbed Spaniards, brings something interesting to the feast. 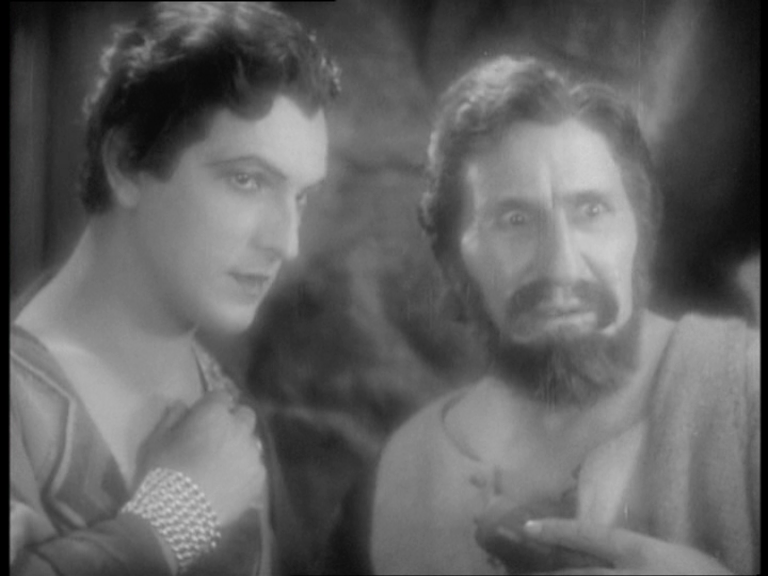 The array of bad guys are amazing fun, rather like in DUNE (in epic cinema, only the villains get to enjoy life) — Gregoire Aslan and Frank Thring make a smutty brace of Herods, Hurd Hatfield and Viveca Lindfors are a smooth Mr and Mrs Pilate, and Brigid Bazlen a red-hot jail-bait Salome. Also Rita Gam from SIGN OF THE PAGAN — and Orson Welles’ VO mentions “the sign of the pagan” being nailed to the temple walls, in straight-faced homage to the Sirk cheesefest. 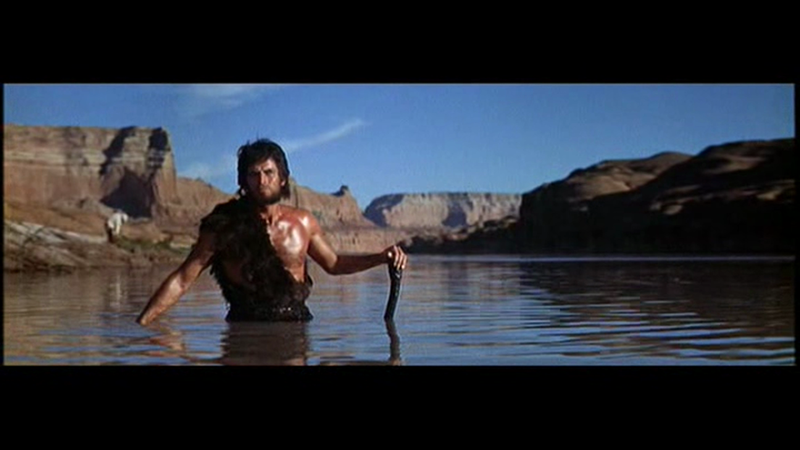 Harry Guardino, though apparently determined to give us his best Burt Lancaster impersonation, is awfully good as Barabbas, and Rip Torn (unrecognizable in his svelte and vulpine youth) is an ace Judas. Flawed is interesting. 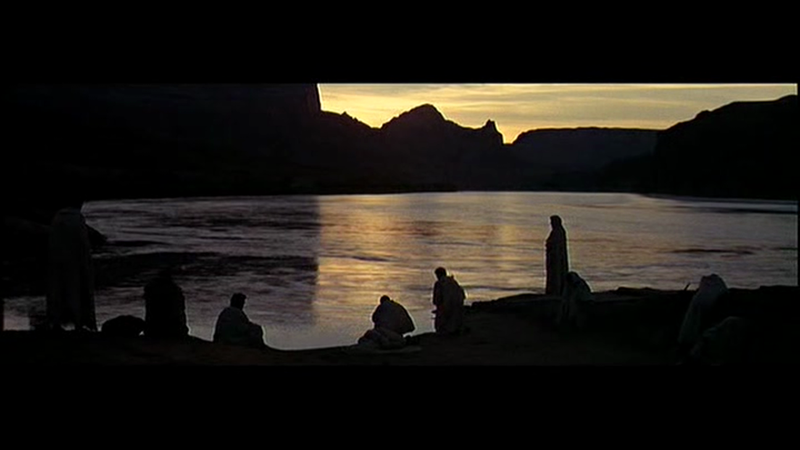 Of course, people like Robert Ryan as John the Baptist, or Royal Dano as Peter aren’t allowed to play flawed (except in Peter’s denunciation scene), but both manage some good scenes. RR is just such a powerhouse. I bet even when they cut his head off he was still the tallest man in Judea. Not sure about his caveman costume, but you can’t have everything. “I found his casting offensive at the time.” ~ Martin Scorsese. As everybody already knows, Jeffrey Hunter as J.C. is the weak link in the Super-Technirama chain. It’s American Epic Acting at its most lifeless, without the muscularity of a Charlton Heston to give it basic dynamism. 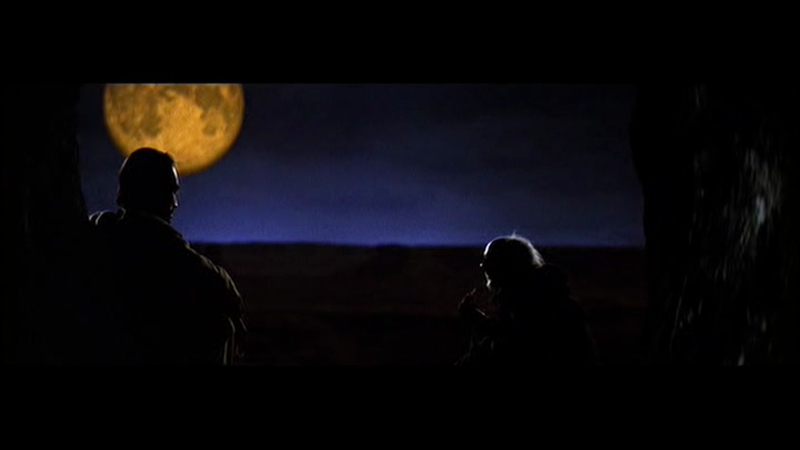 When Ray stages the Sermon on the Mount on the move, it’s terribly effective (one of the things Scorsese borrowed for his LAST TEMPTATION was the idea of Jesus in action, rather than posing for a stained glass window as in THE GREATEST STORY EVER TOLD), but doubly hampered by the facts that Hunter is a poor orator and walks awkwardly. The best thing I can say about Hunter is that his smug smirk when he’s being all mysterious adds a bit of irritation to the character, which is something few actors have pursued (well, maybe Ted Neeley in JESUS CHRIST SUPERSTAR). You’re not supposed to want to slap Jesus. The sensation is surprising, and therefore interesting, and so the movie starts to breathe. Unfortunately, it sometimes seems to be drowning under the waves of Miklos Rosza music. I love M.R., but he does tend to do the expected thing, especially in epics. 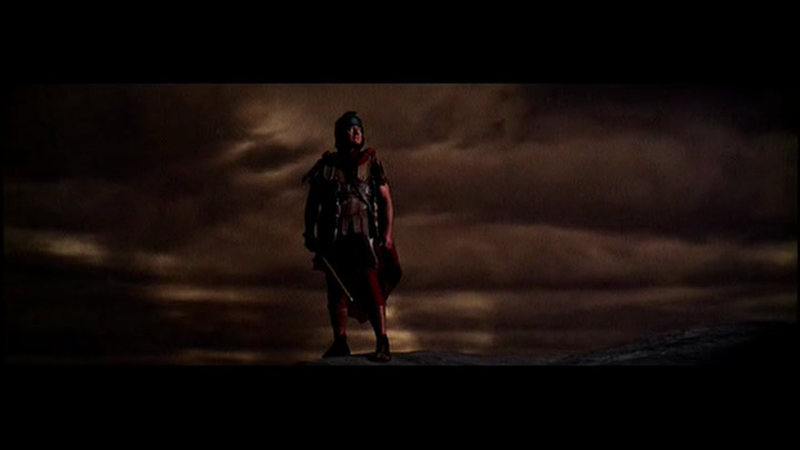 It’s schmaltzy, and that’s fine in BEN HUR but it’s not the effect Ray’s aiming for here, mostly. One the other hand, the Welles VO, scripted by Ray Bradbury from an original idea by God, rarely lets up but gives the film the grandeur and religious emotion Hunter lacks. Welles may not have been the greatest actor ever, but he had a terrific gift for evoking awe and terror in his voice — hammy, perhaps, but effective, like the film. What nobody seems to talk about is the film’s intent. The assumption may be that a Bronston film has no intent, beyond spending the Hollywood money trapped in Franco’s Spain, creating something that could be exported and profitable. But a Ray movie does have a cause, or at least a personal angle. The first things that struck me was the this was a truly post-Holocaust bible movie. The opening features Rabbis executed by firing squad, and bodies being slung into a pit and burned on mass pyres. 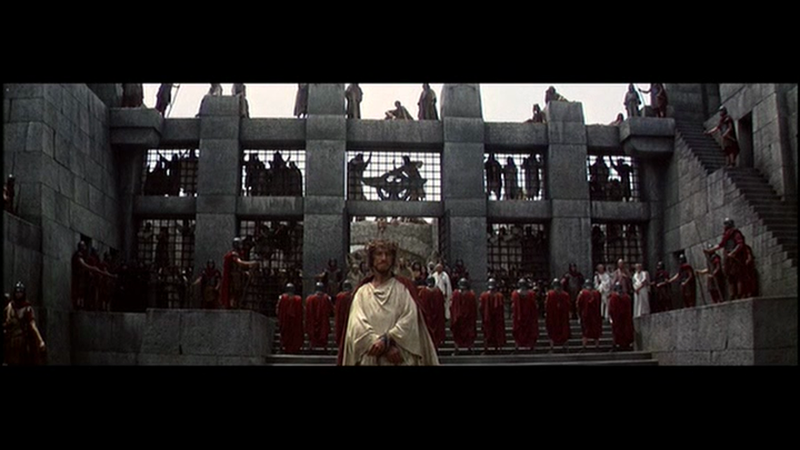 Accordingly, the film plays like the antithesis of Mel Gibson’s antisemitic sermon of hate THE PASSION OF THE CHRIST — here, it’s stressed that Herod is not Jewish, and Pilate, rather than being portrayed as a struggling politician trying to make the best of a rotten assignment, as is often the case, is a hissy, sadistic oppressor, and an idiot who stirs up political foment against Rome by his insensitive response to local traditions. The scene where the mob is offered Jesus and chooses Barabbas happens off-screen — we hear about it along with Barabbas (“Your supporters yelled loudest”) and the dramatic point being made is that Barabbas is moved by the greatness of Christ, not that the durn Jews killed Jeebus. The other shift of emphasis is away from the miraculous. Ray shows healings, some of which are staged to look as if Jesus might be raising the dead, but we don’t get any unambiguous statement that he does so. The drooling maniac is healed in a way that doesn’t look supernatural so much as spiritual or even psychological — Jesus embraces him and brings him to his senses. The walking on water and feeding of the five thousand bit is only described to us in a report to Pilate — the strong impression is that these wacky tales may be merely mass hysteria and rumour-mongering. 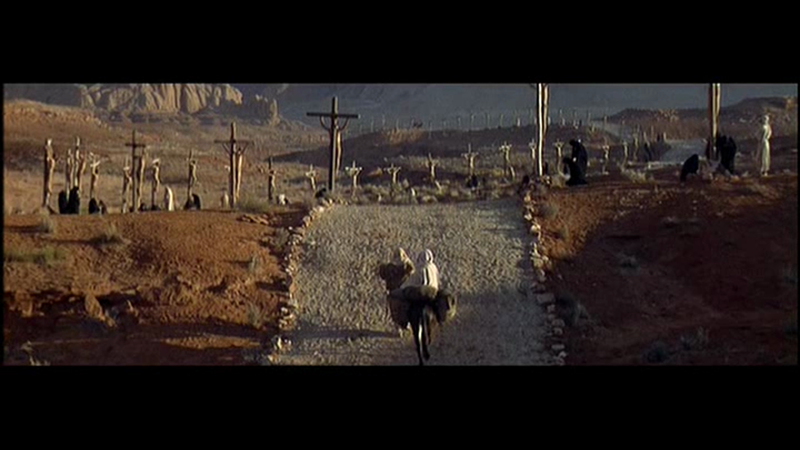 THE LAST TEMPTATION OF CHRIST similarly tried to soft-pedal the magic-working, showing Jesus using herbs and stuff in his healing (though Willem Dafoe does cure one guy using a Thelma Schoonmaker jump-cut to vanish his deformity). You can’t altogether strip the wizardry from the New Testimony without upsetting the very people who are likely to buy tickets, but Ray’s shift of emphasis confirms that he’s not particularly a religious artist, but definitely one involved in humanity — violence, sexuality, politics and psychology are his daily bread. 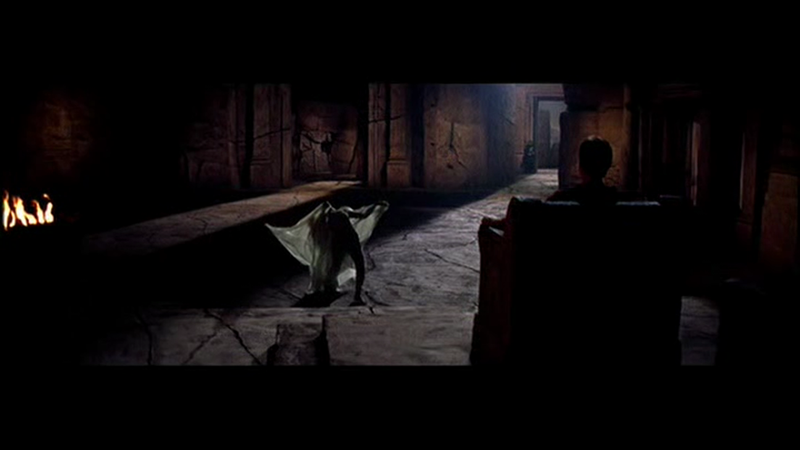 This impressive closing shot, by the way, was merely a test Ray did to see if the idea had legs. The producers, who had abruptly tired or pouring money into the mega-production, refused to let him reshoot it, and stuck the temp version in. 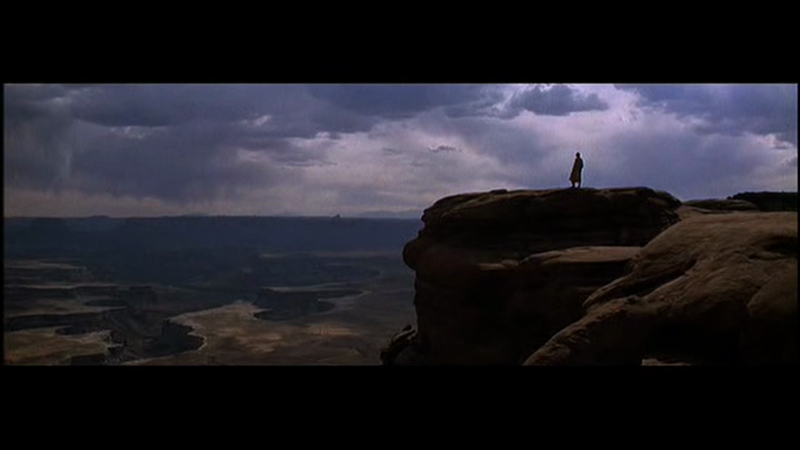 Another compromised Ray ending — if you have the DVD of REBEL, you can see the last shot the movie was supposed to have — one of the best widescreen closing shots ever executed. The day somebody decided not to use it (after Ray had walked off the picture in post), Warner Brothers must have been home to the largest concentrations of human stupidity anywhere in the world.